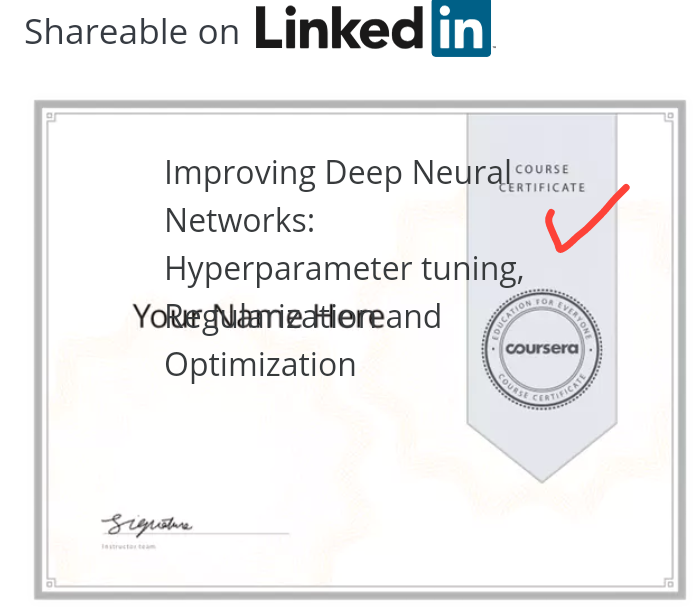 I completed the "Improving Deep Neural Networks [...]" course, but I do not see a certificate link like I see with the "Neural Networks and Deep Learning" course. If I'm missing something, what? And if I don't get a certificate for this course, how do I find out which ones offer certificates, and which ones don't. And secondly, why don't all courses offer certificates? Are you sure about this? On the home page of that course, it is stated that a Course Certificate will be issued. The prototype of the Certificate is also available. Did you contact the support team? There is a "contact us" link at the bottom of that page (the Help Article) which enables you to contact the support team. ...I guess this page explains it: https://learner.coursera.help/hc/en-us/articles/209819063-Solve-problems-with-Course-Certificates. Specifically: "Some course do not offer Course Certificates. 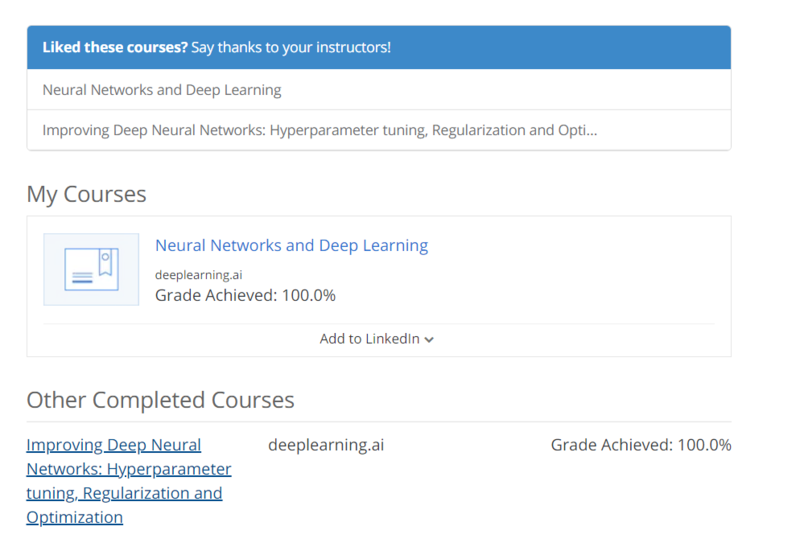 To see which courses you've taken don't offer Certificates, check the "Other Completed Courses section" of your Accomplishments page." Why courses I pay for don't offer certificates is another question. Thanks for your response! So, as it turns out, there must be some kind of background process going on which generates the certificates themselves? I don't recall this being the case with the first course I took, but it took the second course a full hour before the certificate showed up. Compare this image to the previous one. I wonder what happened? Yes, sometimes you just need to wait or refresh your webpage to solve such issues. It's good that you got the Certificate eventually. Congratulations! 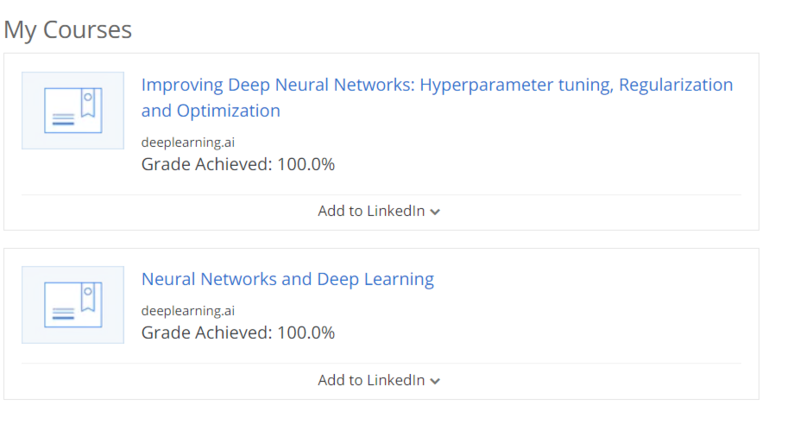 I am also facing this difficulty.I have applied for deep learning specialization.I have completed "Neural Networks And Deep Learning Course and also had paid for it. But I can't find the certification link. So do you know in how many days,can I get the certificate link? or how to solve this problem? Please log out of your Coursera account, log back in, and check it again after a few hours. Click it, select the issue, and answer a few questions. You'll see a "No, I want to chat/send email" message. Then, you'll be able to write to the support team. They will help you resolve it.